Due to lack of sea access, use of a conventional offshore unit was not possible. This led to this unique design of a modular barge able to drill eleven exploration wells between 10m and 50m water depth in Uganda Lake Albert. Through its experience gained in a previous campaign conducted in Sudan, DIETSWELL has designed this moored barge consisting of an assembly of floating modules directly assembled on site to create a 40m wide by 62m long platform. Drilling hardware, offices, and facilities were to be installed on the platform. Living quarter are located onshore in a base camp. 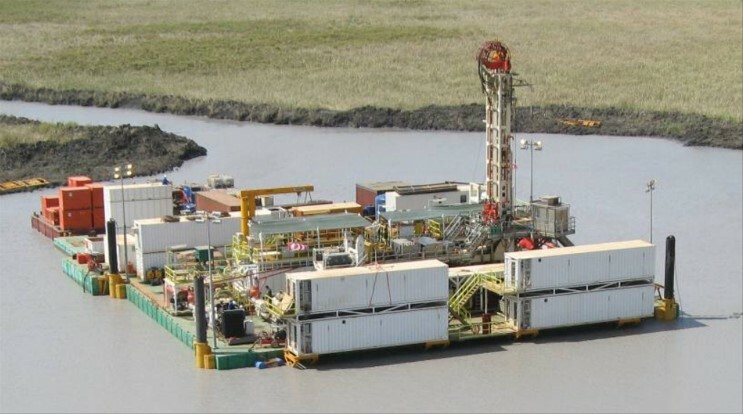 The SEDLAR 250, a Self-Elevating Drilling Land Rig was designed by DIETSWELL to be installed on the barge to drill 4200m deep exploration well.